Custer Air Force Station (ADC ID: P-67 DC-6, NORAD ID: Z-67, DC-6) is a closed United States Air Force General Surveillance Radar and Direction Center station. 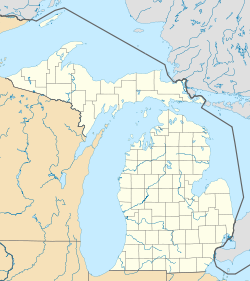 It is located 5.3 miles (8.5 km) west-northwest of Battle Creek, Michigan. It was closed in 1969. Prompted by the start of the Korean War, on July 11, 1950, the Secretary of the Air Force asked the Secretary of Defense for approval to expedite construction of the second segment Air Defense Commands permanent radar network. Receiving the Defense Secretary’s approval on July 21, the Air Force directed the Corps of Engineers to proceed with construction of what became the network of Semi Automatic Ground Environment (SAGE) sites. The SAGE system was a network linking Air Force (and later FAA) General Surveillance Radar stations into a centralized center for Air Defense, intended to provide early warning and response for a Soviet nuclear attack. The SAGE site that would become Custer Air Force Station was carved out of the eastern side of the Army's Fort Custer Training Center near Battle Creek, Michigan. The site was officially established on 18 April 1953. However, the 781st Aircraft Control and Warning Squadron (AC&W Sq) began operations with AN/FPS-3 and AN/CPS-4 radars at the site in April 1952. Initially the station functioned as a Ground-Control Intercept (GCI) and warning station. As a GCI station, the squadron's role was to guide interceptor aircraft toward unidentified intruders picked up on the unit's radar scopes. The site was renamed Custer Air Force Station on 1 July 1956. An AN/FPS-4 replaced the AN/CPS-4 in 1956 and an AN/FPS-6 superseded this unit two years later. Also in 1958 an AN/FPS-20 replaced the AN/FPS-3 search radar. This radar was upgraded to an AN/FPS-66 in 1961. A second height-finder radar was installed in 1959. On 31 July 1963, the site was redesignated as NORAD ID Z-67. In 1958, the SAGE Data Center (DC-06) was established at Custer AFS (Fort Custer). DC-06 was co-located on the Cantonment area of the 781st AC&W Sq. During September, 1959, the 781st AC&W Sq joined the SAGE system, feeding data to DC-06. After joining, the squadron was re-designated as the 781st Radar Squadron (SAGE) (Radar Sq) on 1 September 1959. The squadron provided information 24/7 the SAGE Direction Center where it was analyzed to determine range, direction altitude speed and whether or not aircraft were friendly or hostile. The 781st Radar Sq was inactivated on 25 June 1965 and the sector was discontinued on 1 April 1966. The Gap Filler radars at Saugatuck and Shelby, MI were transferred to the 752nd Radar Squadron, Empire, MI on 27 January 1965, at which time they acquired ID's Z-34G and Z-34H, respectively. Midland, MI was transferred to the 661st Radar Squadron, Selfridge AFB, near Mount Clemens, MI on 4 February 1965, and Richland Center, IN was transferred to the 664st Radar Squadron, Bellefontaine AFA, OH on 15 February 1965. DC-06 was initially under the Detroit Air Defense Sector (DeADS), originally established as the 4627th Air Defense Wing on 8 January 1957. The DeADS was replaced by the 34th Air Division (AD). DC-06 with its AN/FSQ-7 computer remained under the 34th AD until it was inactivated on 30 September 1969 when technology advances allowed the Air Force to shut down many SAGE Data Centers. With the inactivation of the Air Division, Custer AFS was closed effective 31 Dec 1969. Today the site appears to be a light business office park along with being the headquarters of the 24th NORAD Division. The large SAGE DC-06 blockhouse remains, now being a security archives warehouse. There is also a sign on the perimeter fence for a construction trucking company. The buildings in the immediate area of the SAGE blockhouse are in generally good repair, with some still in use. The Battle Creek regional chapters of the Air Force Sergeant's Association and Air Force Enlisted Association use the old Open Mess building. ^ a b Winkler, David F.; Webster, Julie L. (1997). Searching the Skies, The Legacy of the United States Cold War Defense Radar Program. US Army Construction Engineering Research Laboratories, Champaign, IL. ^ a b c d Thole, Lou (1997). "Custer Air Force Station and SAGE". The Friends Journal (Summer 1997): 26–28. ^ a b Bingham, Frank (1965). "Historical Record of the 752nd Radar Squadron (SAGE), Empire, Michigan for the period ending 31 March 1965". Air Force Historical Research Agency. Microfilm Reel # K0603: 1537. ^ Cornett, Lloyd H.; Johnson, Mildred W. (1980). A Handbook of Aerospace Defense Organization 1946 - 1980. Office of History, Aerospace Defense Center, Peterson AFB, CO.
^ Easton, Read (1965). "Historical Record of the 781st Radar Squadron (SAGE) for the period ending 31 March 1965". Air Force Historical Research Agency. Microfilm Reel # K0606: 975. A Handbook of Aerospace Defense Organization 1946 - 1980, Office of History, Aerospace Defense Center, Peterson AFB, CO (1980). Searching the Skies, The Legacy of the United States Cold War Defense Radar Program, US Army Construction Engineering Research Laboratories, Champaign, IL (1997).